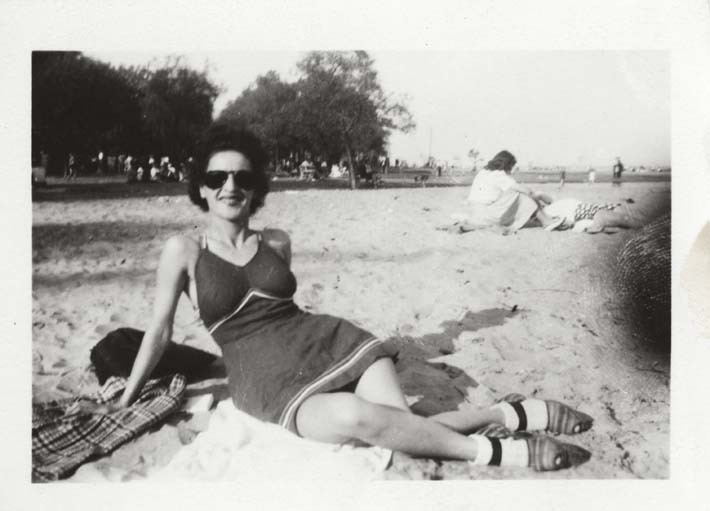 This is a black and white snapshot of Antoinette (Toni) Ciccarelli at the beach. She is seated on a blanket and has two articles of clothing around her (a dark coloured item and a plaid item). Toni is wearing dark large sunglasses and dark lipstick. She is sitting reclined and faces the camera smiling. She is wearing a mid-thigh length dress. It has spaghetti straps and has striped details along the skirt hem and below the bust line. She is wearing closed-toe plaid shoes with white socks. There is a lady sitting a few feet away from Toni in the background; there are other people in the far background near the tall trees.